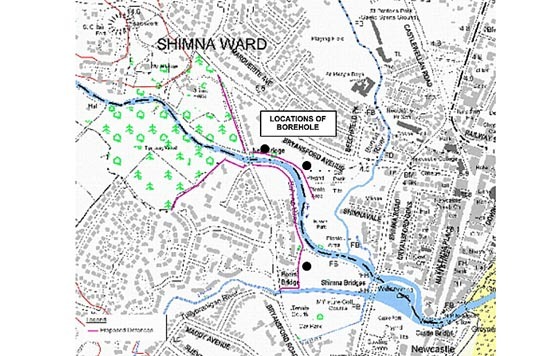 DARD Rivers Agency has engaged engineering consultants who will conduct a feasibility study to alleviate flooding from the Shimna River in Newcastle. DARD is to conduct a study to help lessen the impact of floods in Newcastle. This news has been welcomed by Newcastle Councillor Carmel O’Boyle and Councillor Desmond Patterson. Cllr O’Boyle said: “Following the very serious flooding event that happened in this part of Newcastle in August 2010, local people have been calling for work to be carried out along both sides of the Shimna River that would defend their homes from future devastation of this nature. On that occasion homes were flooded from Bryansford Avenue right across to the Bryansford Road, with areas that had never been affected in the past, submerged in flood waters. “Housing developments along both of these stretches were inundated, and the whole experience has left householders very nervous about possible future flooding. So this study is very welcome news indeed, and I understand that the plan is to erect flood defence banks along both sides of the Shimna River to defend the homes and land within the flood plain. It is important that until this Rivers Agency study is completed and the findings made public, no further development should take place anywhere within this highly sensitive area. “While this will require a moratorium on development within the immediate area of the flood plain study, to my knowledge there is nothing in the pipeline anyway. Until Rivers Agency makes public its plans to protect vulnerable areas that lie within the Shimna River flood plain, it would be inadvisable for development to be contemplated. Cllr Desmond Patterson added: “This is a good news story for the people, particularly those who live anywhere along the Bryansford Road and Bryansford Avenue areas of Newcastle. A new flood alleviation scheme that protects these areas will come as a welcome relief to the residents of this part of Newcastle. In the meantime we must let the Rivers Agency get on with their work, and I look forward to reading their report and finding out where we go from there. “The storms we all experienced on Sunday night are a sharp reminder of how easily flooding can happen in Newcastle. People need to feel that their properties are safe from flooding, so a defence bank on both sides of the Shimna River would offer the protection they need,” he said.